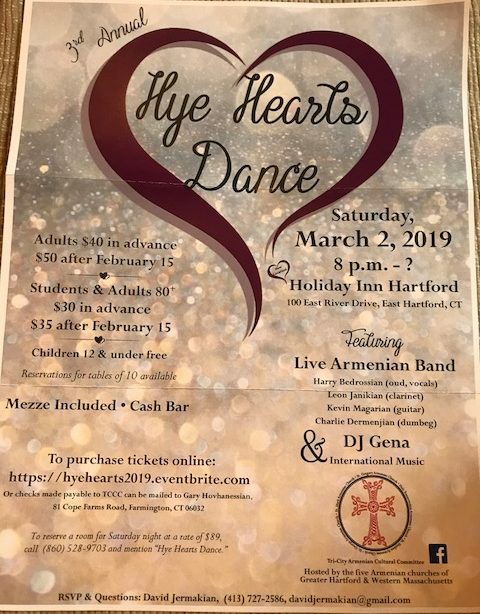 New England-area parishes will hold the 3rd annual “Hye Hearts Dance” on Saturday, Mar. 2, at 8 p.m., at the Holiday Inn Hartford (100 E. River Dr., East Hartford, CT). Sponsored by the Tri-City Cultural Committee (Armenian churches of greater Hartford and western Mass.). For information and ticket purchase details, click here to view a flyer. Click the link to buy tickets online.